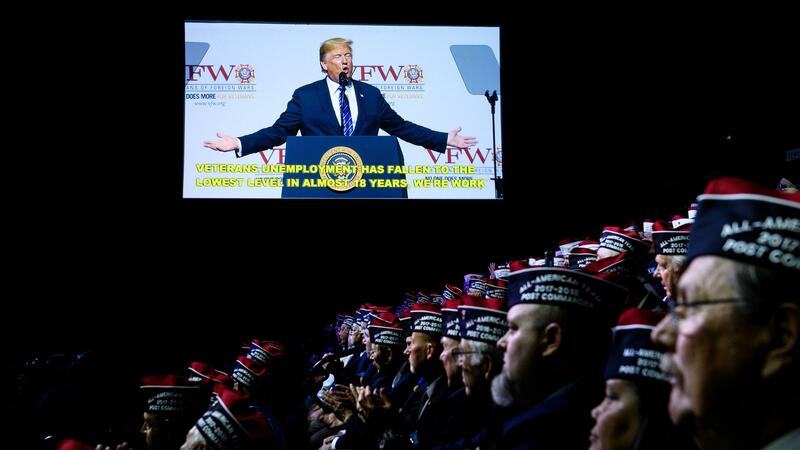 President Donald Trump seen on a video screen as he speaks at the 119th Veterans of Foreign Wars National Convention, Tuesday in Kansas City, Mo. "We're also working to bring back the remains of your brothers-in-arms who gave their lives to Korea," Trump said to cheers. "And I hope that very soon these fallen warriors will begin coming home to lay at rest in American soil." Trump also touted achievements on reforms at the Department of Veterans Affairs, and praised the newly confirmed VA secretary Robert Wilkie, who accompanied the president to Kansas City. Trump said the VA had been empowered to more easily fire poor performing employees, and promised that a revamped version of the Veterans Choice Program would clear the way for vets to see more private doctors. The White House is currently in a dispute with some members of Congress about how to fund the program. A scheduled speech by the acting VA secretary was apparently cancelled, and Trump didn't invite Wilkie to address the crowd. Frank Morris of member station KCUR reports from the convention floor that the enthusiastic crowd was predominantly white, male and older. The reaction of 89-year-old Anthony Maroney was typical. "He gave a darn good speech, I'll tell you that," said the Army Airborne veteran. "He was for everybody, not for himself, but everybody, all the vets who were here." But some expressed concern about how the federal government would pay for the veterans programs the president pledged to support. And last week's summit with Russian president Vladimir Putin worried others. "With Russia, I think he's making a huge mistake," said Timothy Juliett, another Airborne veteran. "They have been an enemy of ours for eons." In a break from tradition, Trump used the non-partisan organization's backdrop to invite a Republican candidate for Senate up to the stage, yielding the mic to Missouri Attorney General Josh Hawley, who is running to unseat Democrat Claire McCaskill. Trump criticized McCaskill and several other Democrats by name. VFW spokesman Joe Davis told NPR, "The VFW is a nonpartisan organization but we routinely host elected officials and candidates, such as candidates Trump and Clinton in Charlotte [N.C.] in 2016." Frank Morris of member station KCUR contributed reporting from Kansas City, Mo.